BARBARA LAWNICKI (Arlington) - Book Appointment Online! 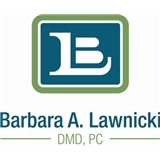 Welcome to the woman-owned practice of Dr. Barbara A. Lawnicki where we specialize in beautifying the smiles and maintaining the dental health of patients of all ages using the most up-to-date dental techniques and safety practices. We are a family practice with the ability to take care of all of your dental needs. Each and everyone of us take great pride in our work and believe we have a unique ability to make you feel comfortable, no matter how anxious you may be. We promise that you will be treated like family from the moment you arrive at our office. We are proud of our work – let us help you be proud of your smile. Give us a call to make an appointment for yourself and your entire family to not only meet me and my staff but to also learn about all the services we offer and experience what ”family” dentistry is really all about…. She was a very informative, friendly and straight forward doctor!